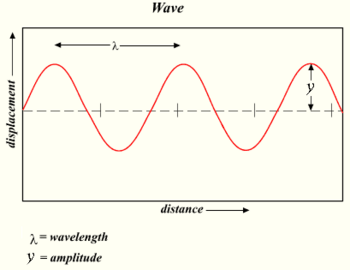 The amplitude or peak amplitude of a wave is a measure of how big its oscillation is. Amplitudes are always measured as positive numbers (for example: 3.5, 1, 120) and are never negative (for example: -3.5, -1, -120). That's because distance can only be greater than zero or equal to zero; negative distance does not exist. The distance from the top of one peak to the bottom of another is called peak-to-peak amplitude. Another way to describe peak-to-peak amplitude is to say that it is the distance between the maximum positive value and the maximum negative value of a wave. Amplitude Facts for Kids. Kiddle Encyclopedia.